Curti Aerospace is pleased to announce that Zefhir is finally ready to show its potential in flight. One year after the official presentation right here at AERO 2018, we are proud to confirm that the Zefhir helicopter has brilliantly passed hundreds of flight test hours and thousands of hours on the test benches. As of today, Zefhir begins a new phase where flight enthusiasts can see first-hand the quality and authenticity of the project. The Zefhir helicopter boasts the highest safety standards in its category, adhering to the CS-27 requirements even as a two-seater helicopter. It also has a unique ballistic parachute system which is designed as an emergency backup when autorotation is not possible, and is equipped with a turboshaft engine instead of a traditional piston engine. The turboshaft engine delivers consistent performance at high altitudes and high temperatures, making Zefhir easier to control and command. Indeed, Zefhir is the easiest-to-fly helicopter in its class. The structure made entirely of composites, as are the main tail and rotor blades, which maximizes lightness and optimizes the shape from both an aerodynamic and design point of view. All components have been optimized from a fluid-dynamic and structural standpoint in order to obtain maximum efficiency, eliminate unnecessary weight and make the flying experience exceptionally involving. In addition, the turboshaft engine comes with a digital electronic control (FADEC) so that the pilot can concentrate on the flight controls while flying without worrying about the engine during delicate operations. HOW TO TAKE PART IN THE FLIGHT DISPLAY. Flight displays will be held on both Wednesday and Friday at 5 p.m. (for about 15/30 minutes), taking off from Markdorf Airfield. You can attend by signing up via the registration form. Just enter “flight show” in the message and the date on which you would like to attend the flight demonstration. During the show, you will be able to see the helicopter’s great agility, manoeuvrability, low noise and ease of use in all conditions. THE PARACHUTE, A STEP FORWARD IN HISTORY. 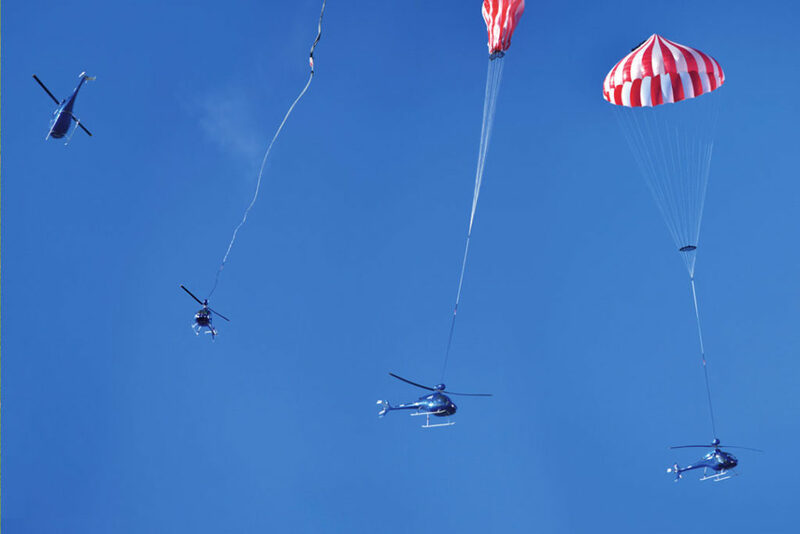 During this edition of AERO, we will also focus attention on the ballistic parachute system test, which took place last June 22. It was an absolute first in the world of aerospace, as there is no documentation or evidence of this type of test in the history of aerospace technology. The helicopter was brought to an altitude of about 300 meters and a forward speed of 30 knots. At that point, the ejection of the parachute took place without any problems and in the expected manner, as was also the case with the deployment of the parachute, which was completely open after 6 seconds from the ejection command. The helicopter’s descent speed was 7.5 m/s (27 km/h). Upon impact with the ground, acceleration peaks were recorded that fall within the parameters of crash tests in both the aeronautical and automotive sectors. The test data show that the system is likely to achieve its goal of saving lives, even at a lower altitude of just 150m.